There are many fine places to hunt waterfowl throughout the Pacific Northwest. Here are a few favorites. 1. Summer Lake, Oregon: Many generations of waterfowl hunters from around the Pacific Northwest grew up hunting Summer Lake in central Oregon's high desert region. Early-season duck and goose hunting can be very good, with snow goose and Canada goose hunting getting better as the season progresses, until freeze-up. Camping is available, check-in is required. 2. Tillamook Bay, Oregon: A great place to take the boat and cover water, Tillamook Bay, in the northwest corner of the state, offers good puddle duck hunting late in the season, with widgeon dominating the take. It's also one of the best places to pursue sea ducks and divers, with scoter, goldeneye, the occasional harlequin, and more. 3. Humbolt Bay, California: Ducks and geese galore, and great public access for your motorized duck boats. Black brant are a draw here, as are sea ducks, divers and Aleutian Canada geese. When the Aleutians are hammering the fields late in the season, access is a challenge, but PacificOutfitters.com can take care of you, and their rates are very reasonable. 4. Columbia River, WA & OR: Big water and lots of birds with loads of access along the Washington and Oregon borders. Perhaps the best river in the region to secure an array of divers and puddle ducks, and the Canada goose hunting can be great, too. Decoying both puddle ducks and divers along the protected edges can be exceptional. When storms kick-up, be careful, this is serious water. 5. Willamette Valley Rivers, OR: The Willamette River and its tributaries offer much public access, be it with a drift boat or sled. Puddle duck shooting can be good from late November on, and if the surrounding fields and ponds freeze, the rivers are where you want to be. Decoying in sloughs can be red-hot on icy days. 6. Willamette Valley Fields, OR: With the influx of multiple subspecies of Canada geese holding in many of western Oregon's rye grass fields all season long, the real estate between Salem and Eugene is prime. Travel the I-5 corridor, and Highway 99, looking for geese working fields along with flags farmers have put out to keep geese away. Cacklers can be in flocks of 5,000 or more, and they move around, but many farmers want them gone. 7. Snake River, OR & ID: Early in the year the hunting for resident ducks can be good, but late-season migratory hunts can be exceptional. Mallards, widgeon and wood ducks abound, along with divers. This is big water, and a motorized boat is a must. 8. Klamath Basin, OR & CA: Several hunt areas lie within the Klamath Basin. Opening weekend waterfowl hunts in both the California and Oregon portions of Lower Klamath Refuge and Tule Lake Refuge are authorized through a draw permit only. Applications are accepted Aug. 1-31. Throughout the season, other areas require check-in, some are on your own. There are marshes and grasslands you can walk through, other places you'll need a boat. Learn more at fws.gov/refuge/Tule_Lake/visit/visitor_activities/hunting/waterfowl.html. 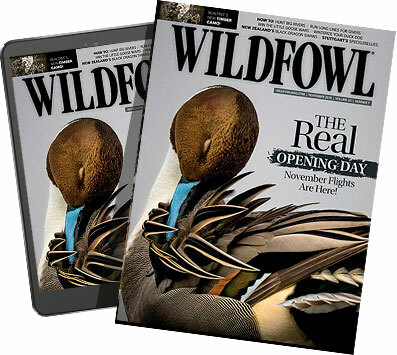 For more articles like this, pick up a copy of Wildfowl at your local newsstand or click here to subscribe or pick up your digital subscription now.